Victoria (Seychelles) – April 24, 2017 (travelindex.com) – James MacGregor, of eco-plannet, the known and highly respected Sustainable Tourism planner, educator and author has decided to throw his support behind Alain St.Ange, the Seychelles Candidate for the coming United Nations World Tourism Organisation (UNWTO) elections for Secretary General (SG). In a letter this week James MacGregor wrote to Alain St.Ange as support for his appointment as Secretary General to the UNWTO. James MacGregor writes:- “It is a pleasure and an honour for me to give my unequivocal support for your selection as Secretary-General to the UNWTO. You have had a spectacular career in terms of positioning the Seychelles as a prominent island tourism destination however it has been your leadership on the world stage that has been so inspiring. In particular I have admired your relentless encouragement for a more environmentally responsible and sustainable tourism development approach at all levels of the supply chain. As well you have put these sustainable principals into practice in the Seychelles and have been able to bring practical examples and solutions you to your colleagues around the world. Given the unfortunate continued degradation of our natural tourism environment while still faced with substantial annual tourism growth rates across the planet, the need for the implementation of sustainable tourism practices is more urgent than ever. Your career has demonstrated a consistent and committed approach to protecting these resources for future generations of tourists and tourism suppliers. 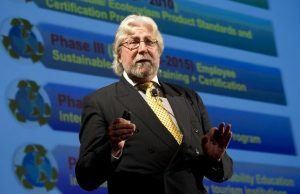 You unquestionably bring practical sustainability skills and professional understanding of these serious conditions to ensure that the UNWTO will continue to seriously advance sustainable tourism development well beyond 2017. It is in this context that it is a pleasure to offer my support for your appointment as the new Secretary General to the UNWTO”. For Alain St.Ange, this latest endorsement arrives barely three weeks before the elections for the SG of the UNWTO. “Sustainable Tourism and the protection of what we have been blessed with is one of the key mission statements we have echoed for action at UNWTO. We need as a world to be seen as good custodians of what we have been blessed with. This will ensure long term tourism which will help alleviate poverty in so many countries” said Alain St.Ange who has amassed a large number of endorsements from the world of tourism, marginalised groups, politicians, press among others.